Books & Boos Press is pleased to present the cover for Insanity Tales II: The Sense of Fear. Artist Melinda Phillips created the cover, which plays off of the eye theme from the original Insanity Tales anthology cover. Insanity Tales II: The Sense of Fear will debut in early October. To learn more about the authors involved, visit http://www.thestoryside.com. In preparation for our upcoming release of Insanity Tales II: The Sense of Fear this October, we are giving away three print copies of Insanity Tales, the book that started it all. Enter for your chance to win a copy here. Our newest anthology, Insanity Tales II, debuts in October and contains eleven tales from six authors: David Daniel, Stacey Longo, Dale T. Phillips, Rob Smales, Vlad V., and Ursula Wong. We have continued the tradition of asking accomplished authors to contribute forewords to these collections. We had Jonathan Maberry write the first one; this time we brought in the talented Joe McKinney to contribute a foreword to this great collection that we know you will love. The giveaway ends on September 13, so be sure to enter here today! This weekend readers can meet the authors of Insanity Tales at two different places. Stacey Longo is one of the five authors in the collection. She will be signing the book at Vermont Comic Con on Saturday and Sunday at the Sheraton Hotel located at 870 Williston Road in Burlington, VT. The convention’s hours of operation for Saturday is 10 a.m. to 7 p.m. and 10 a.m. to 5 p.m. on Sunday. The other authors in the anthology will be at the Brew’d Awakening Coffeehaus on Sunday. 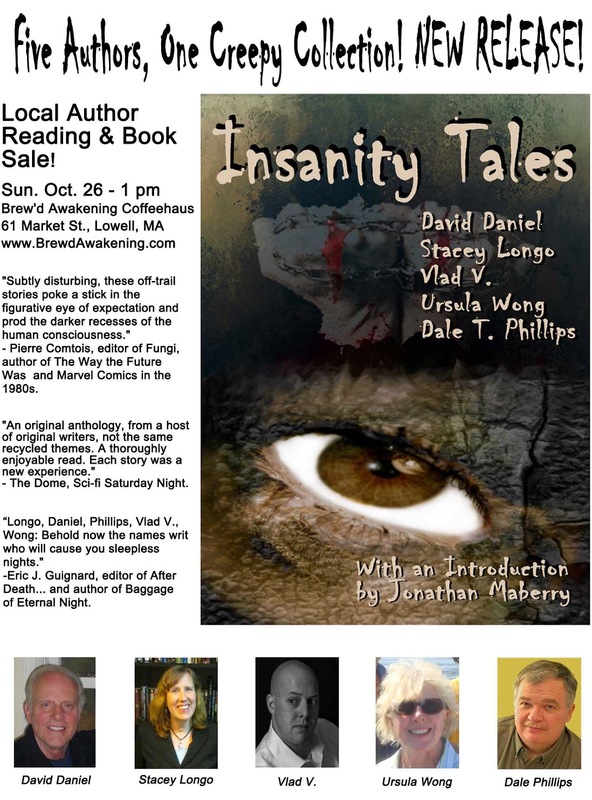 Authors David Daniel, Dale T. Phillips, Vlad V., and Ursula Wong will start signing copies of Insanity Tales at 1 p.m.
Insanity Tales contains short stories and one novella with a foreword by award-winning author Jonathan Maberry (Rot & Ruin). Enter a world of madness as you read these nine tales of twisted psyches, peculiar people, and demons of the mind and spirit. A few weeks ago, the authors of the anthology, Insanity Tales, were on the Sci-fi Saturday Night podcast. David Daniel, Stacey Longo, Dale T. Phillips, Vlad V. and Ursula Wong were discussing their writing and their work in this new collection. You can find the link to download the episode here. Author Stacey Longo will have copies of Insanity Tales on hand at the Books & Boos table at Rock & Shock this weekend. She will also be on a panel with Joe Knetter and other authors at 12 p.m. on Saturday. It’s the perfect time to ask her a question about this collection from Books & Boos Press. She will also have copies at her table at Vermont Comic Con, which takes place next weekend at the Sheraton Hotel located at 870 Williston Rd in Burlington, VT.
Dale T. Phillips and Vlad V., two authors in the Insanity Tales anthology published by Books & Boos Press, will be signing copies of the book at Haunted Acres in Candia, New Hampshire this Saturday, Oct. 11, from 6 p.m. to 11 p.m.
It’s a collection containing stories and one novella by such illustrious authors as David Daniel, Stacey Longo, Dale T. Phillips, Vlad V., and Ursula Wong. Enter a world of madness as you read these nine tales of twisted psyches, peculiar people, and demons of the mind and spirit. This anthology includes a foreword by award-winning author Jonathan Maberry (Rot & Ruin) and the cover was created by Melinda Phillips. If you can’t make it to Haunted Acres to see , you can purchase the paperback by clicking here or the e-book here.